Sally with Dr. Kobos just after we thanked her for saving our little girl’s life. Hi all – Over two years ago, and several times in between, we didn’t know if we’d ever get to write this blog post. Sally had just been diagnosed with a rare form of Infant Leukemia that had a dismal survival rate. Today, here we are, Sally just received her last scheduled dose of chemo, and is officially considered post-treatment. Today brings a plethora of emotions – excitement, happiness, nervousness, fear, guilt. Until this morning, we had thought that Sally had already had her last dose of chemo. It has taken over three weeks and three antibiotics to get Sally’s pneumonia under control, the team decided to cancel the final two days of chemo she was scheduled for since her immune system was already taxed. This brought mixed feelings, happy we could skip the chemo but in a strange way sad that we wouldn’t have the closure that comes with passing a finish line. We all came in today as a family for Sally to get her bone marrow aspirate, the official end of treatment, to get some sense of closure. 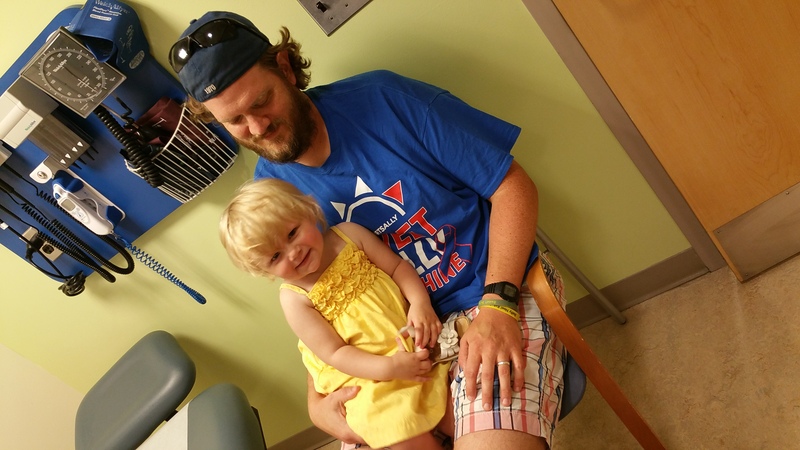 However we were surprised to find out that she would get one final dose of chemo in her spine. As Nicole said, it was meant to work out this way. When meeting with Dr. Kobos we had some questions about post-treatment care, and I found myself crying, the building emotions of the last few weeks finally coming out. I looked at her through tears and just said “thank you” for saving Sally’s life, stopping her in mid-sentence as she was answering a question for Nicole. We all got up and shared a hug, getting that final closure we needed. So what happens now? A lot of Sally’s restrictions have been loosened, we can start slowly transitioning back to “normal”. Because she still has the port in her chest, we still have to be somewhat cautious and bring her in with any fevers for the next few months. She’ll return to MSK monthly for blood checks, and will get a bone marrow aspirate every three months. Other than that, the main focus of treatment now switches from killing cancer to healing her body from two years of intense chemo. 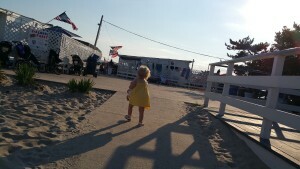 Sally is finally walking, a major milestone in this healing process. Another major challenge will be getting Sally to eat by mouth instead of her feeding tube. Because she never really ate before she was diagnosed, and has barely eaten in the two years since, she doesn’t possess the oral muscle strength for eating. She also doesn’t have much of a desire for it. Transitioning away from the feeding tube will take some time, we are slowly phasing out her anti-nausea meds, and hope her tastes and appetite will improve. We’re in the middle of testing to determine what caused Sally’s aspiration pneumonia. The last test was inconclusive, we couldn’t get her to eat or drink as she was terrified of being in the exam room. A few weeks ago she was terrified to be in the dentist office while the rest of us were getting our teeth cleaned, our little girl simply is scared of any hint of a medical atmosphere after everything she’s endured. We can’t blame her. We’re still awaiting results from her bone density test last month to determine if she will require further treatment for bone weakening from the steroids. As you can see, Sally’s story isn’t over, we’re just starting a new chapter. Not just Sally, but all of us. This week we booked two trips to Buffalo and Florida for this fall after doctors cleared us for travel. These are our first family trips in over two years, off to see friends and family of which many haven’t seen Sally since she was an infant. We’re also looking forward to some much needed down time as a family, and will be ending the trips with a visit to Disney World. As we were leaving MSK today, we saw Dr. Steinherz. I went up, shook his hand and thanked him, not sure what else to say to someone who saved my little girl’s life. Nicole yelled “We love you” over my shoulder. He walked away and we noticed an upset woman following him, she had the look we know all too well of someone who received devastating news. A few minutes later she came up to us and revealed that her son had just been diagnosed with Leukemia and was unsure of where to have him treated. She heard what we said to Dr. Steinherz and wanted to ask us about it. We told her of our experience at MSK and that we too had to make the same decision two years ago. We gave her our contact info and as she walked away, I hugged her and told her whatever decision she makes is the right one, and to never second guess any decision she will make in this battle. We saw lots of friends in this visit, all excited for Sally, but that encounter with the mom has stuck with me all day. It brought to life those early days, and made me revisit what we’ve been through. In the end, I’ve decided that it was a sign. 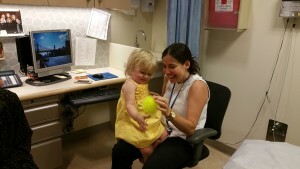 Maybe it was a sign for the mom that MSK was the right place for her, we agreed that it might be. But I think it was a sign confirming that Nicole and I are meant to support future families battling childhood cancer, and continue battling to secure better treatments for these kids. I’ll continue to run the Childhood Cancer Dads Support group online, and we’ll both help the foundations we’ve grown to see as our extended family in any way we can. We encourage all of you to Go Gold for kids like Sally this September and help us raise awareness for childhood cancer research. Kids shouldn’t have to endure what Sally did and will continue to deal with the rest of her life. So this is it. We’ve crossed the finish line in the marathon we’ve been running for two years. We are so thankful for the continued support – our doctors, our nurses, all the staff at MSK, our therapists, fellow cancer families, the organizations that supported us, our employers, coworkers, our neighborhood of Bay Ridge, family, friends, those who sent meals and donations and all of you reading this. We could not have done this without you. I’m crying writing these final lines, overcome with the love you have all shown Sally these two years. You will always be family to us, never hesitate to say hi or introduce yourself, we want to put faces to the support we’ve had and thank you personally. And to all the families we’ve fought alongside, we are proud to count ourselves among you. You have shown us the extremes of love, support and determination. Each of you will continue to live in our hears for the rest of our lives, the memories of those we’ve lost at the forefront of our minds forever. We will still continue to share updates on Sally from time to time, in the meantime we’re going to begin the transistion to the next phase of our life. Please wish us luck. And please keep Sally amd all the childhood cancer families in your thoughts and prayers. Thank you all, we love you. I’ll continue to mention Sally ‘ s name at services each week, praying for a “refuah sh’lemah”, a complete and total healing of her body and her spirit. You are the awesome-est parents! <3 <3 <3 <3 sending love to each of the Kabels most especially Sally sunshine. Sally and family you will continue to be in my prayers. Enjoy your trips and as you transition into the next phase on your journey know that you are still being lifted up to make it through this next phase. I know we all will have a special place in our hearts for Sally and look forward to news and strides when you can share. So happy for All of you. Sending the warmest and most sincere wishes for GOOD LUCK, HEALTH, HAPPINESS, A LONG HAPPY LIFETIME OF DREAMS COME TRUE AND THE ABILTY TO THRIVE/RELAX AS YOU TRAVEL AND LIVE IN HAPPLILY EVER AFTER LAND!!! Thank you for sharing Sally and your family in such a heartfelt, eloquent way with visuals….you are truly a beautful and awesome family-:)!! ALL THE BEST & HUGS TOO! Thanks for your wonderful writing and updates…our prayers will always continue for you and your family…we love you all…. What a wonderful and terrifying feeling you and your family must be experiencing, I can’t even imagine. I have been following Sally and am so happy to hear this news. You and your family will continue to be in my prayers. Best of luck. I am one of many who fell in love with your precious Sally, and gained much respect and admiration for your entire family. I wish you luck, of course, and a future filled with all that childhood to adulthood is supposed to hold! Blessings to you and your family on the next phase of your lives. I will always look very forward to seeing Sally’s growth, and just her adorable self! Hugs all around! Reading this crying. I’m so happy for Sally and your entire family. You did it Sally, way to go!!! Your writing is eloquent and heartfelt. Thank you for you for sharing the story of your beautiful girl. Blessings to your family, enjoy your much deserved vacations! I don’t have enough words to describe how impressed I have been by your entire family throughout all of this. Even on the periphery it has been truly amazing to watch how you all battled in the face of incredible adversity. So happy to be reading this post and wishing all of you good news and health. Congrats guys. I can’t imagine what you must be feeling. But following you on this journey for two years I know I am feeling relieved and hopeful. I have a beautiful 2.5 yr old girl and everyday I look at her and think of Sally. Of course I will continue to keep all of you in my thoughts and prayers. Here’s to a beautiful future! I’m not sure how I came across Sally’s story, but it was a long time ago and I’ve been following ever since, never scrolling past an update. I’ve never met you, and I probably never will, but I feel such pride and excitement for you as if you were my own family. Reading through everything you’ve written and endured, watching Sally walk, and seeing other little girls wearing her nail polish has touched me personally. There is no doubt for anyone who has followed that Sally was born into one of the most supporting, selfless and strong families I have ever seen. Battles are never easy, but the feelings that triumph brings outweighs the pain in the end. Your family has touched my heart from many states away. I had tears in my eyes reading this tonight. Your fight to not only save your daughters life, but to stay strong in a marriage and as parents to two gorgeous children, is an inspiration that I hope has an impact on anyone struggling with even the smallest of challenges. You are a blessed family, and you have blessed all of us who have had the privelage of getting to know you during this journey. Thank you for sharing, even during the most trying times. I wish I could edit this, I meant to say two other gorgeous children (as well as the beautiful Sally)! It’s so beautiful and inspiring to see your dedication and concern for others. We’ve all been blessed to be beside you, to see your amazing Sally, your boys, your love for one another. There’s so much I wish I could convey here but I will say that we will all be going gold, continuing to support anyway we can. Much love to each of you, happiness and health! God bless you all as you all go forward together into the new chapter. This is great news! Congratulations! We have been praying for Sally and your family since your first blog. We met you briefly at a blood donor celebration where you spoke. My daughter who was 15 at the time spoke right after you. She received a bone marrow transplant 2 1/2 years ago with her brother being her donor and Thank God is doing great! She had a very rare blood disease Aplastic Anemia. Something you said that night has stuck with me. Emily was literally being kept alive by transfusions. I know this sounds so ignorant but I never really thought about where they came from, we had a private blood drive for our daughter but I never thought there could be shortage. After your speech, our whole family donates as much as possible. Our said she was a happy to be a kid speaking after you because your speech was so great! She said you were a very hard act to follow! You may not realize how much you did for that woman you met today. We were first diagnosed at a hospital on Long Island, I didn’t know what to do or where to turn. Lucky for us one of our friends is one the three guys that founded St. Baldericks. With his help and the help of a doctor a CHOP we found Dr. Boulad, our hero! I remember that first day at MSK wondering if this is where we should be, a mom,her name is Jill, came over to me and said “nobody expects you to be anywhere else” she said she and her husband were physicians and this is where they picked to have their son treated. She said “you’re in the right place”. I hadn’t realized I was so easy to read just sitting there but I guess we all are. We all have FEAR written all over us. Nobody can prepare you for the terrifying journey but having people who understand is such a gift. We just love Sally! We knew she had this! Your boys are so sweet and love the pictures of the boys loving up Sally. You and Nicole have a beautiful family! We are so happy for Sweet Sally Sunshine and your whole family. God Bless You!! We are always sending Sally and your family prayers and everything positive!! God Bless Sally and all of you. I will continue to pray for Sally, William, Thomas and both of you. Enjoy your transition. Enjoy life and thank you for sharing your story. Sweet Sally Sunshine is a trooper! What an amazing and terrifying journey you all have been through. You all deserve those much needed vacations that you will be taking. Matt and Nicole, I have loved reading everything about your family and the ups and downs that you have experienced. Sally is a special little girl and will continue to follow your story as you navigate through life. Much love to your whole family! I wish you well as You all continue your journey. Please remember that GOD takes us all the way through. GOD is holding Sally’s hand. Prayers continue. So happy for Sally , you, Nicle and your family. May this new chapter be filled with good health and an abundance of happiness. God be with you as you all travel the road ahead. Hope to see you in OP in the Fall. Oh just reading this letter Matt brought tears of gladness to our eyes. What a journey. First we thank God for bringing Sally Sunshine through this two year ordeal. We now thank you and Nicole for writing such heart felt letters to all of us many of whom you do not even know. Sally has become one of our family members. We have prayed daily for her and your entire family since those first bleak days. She is one lucky girl to have such loving, devoted parents. So glad to hear you have all finally crossed the finish line. I will continue to keep Sally and the rest of the Kabel clan in my prayers, but for now, enjoy this moment, you all deserve it! I will continue to keep Sally and your sweet family in my prayers. God bless you all, always!! As part of Sally’s Upstate New York fan club, we’ve read every post these past two years. We’ve cried, worried, and celebrated along with you. As a matter of fact, the recent video of Sally walking was the most beautiful thing we’ve ever seen and heard! Please know that as you enter this next chapter of your lives, we’ll continue to hold your family in our hearts. If you have any suggestions for how we can help spread the word about the inadequacy of research & funding, we’d be glad to join the cause. Best of luck to a very courageous, generous family! And: You go, Sally! Congratulations Sally! Good luck to you and your family. Enjoy your next chapter in life and please keep us posted on Sally. That is wonderful. Congratulations, Sally!